Female Oregon spotted frog (Rana pretiosa). Photo by Kelly McAllister. The Oregon spotted frog is a medium-sized aquatic frog endemic to the Pacific Northwest (Figure 1). Historically, it was distributed from southwestern British Columbia, Canada to northeastern California (Cushman and Pearl 2007). Today it is known from about 46 occupied locations in British Columbia, Washington and Oregon (USFWS 2011, Bohannon et al. 2012). In 1997, the U.S. 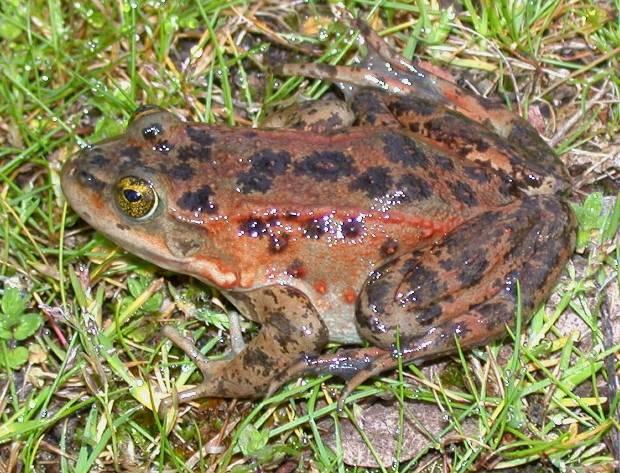 Fish and Wildlife Service concluded that federal listing of the Oregon spotted frog as Endangered or Threatened was warranted but precluded from listing by other higher priority species (USFWS 2010). Museum specimens and substantiated accounts indicate Oregon spotted frogs were found in both the Puget Trough and East Cascades. The most significant factor contributing to the decline of Oregon spotted frogs is the loss and alteration of wetland habitat. Oregon spotted frogs have life history traits, habitat requirements, and population characteristics that make them vulnerable to such loss and limit their distribution. The species persists in only six Washington locations (Figure 2). Conboy Lake had the largest population in Washington until 2012, but has undergone a >86% decline in egg mass production since 1998. Hydrological issues will determine whether or not this population recovers to 1990s levels. Species inventory and monitoring. Several agencies, land owners, zoos, conservation groups, and volunteers coordinate with WDFW on annual egg mass censuses in Washington. In 2011, WDFW, with financial support from USFWS, initiated egg mass surveys in Whatcom and Skagit counties and found two new isolated breeding populations on private lands in the South Fork Nooksack (Black Slough) and near the headwaters of the Samish River near the town of Acme, areas that were not historically known to host the species. 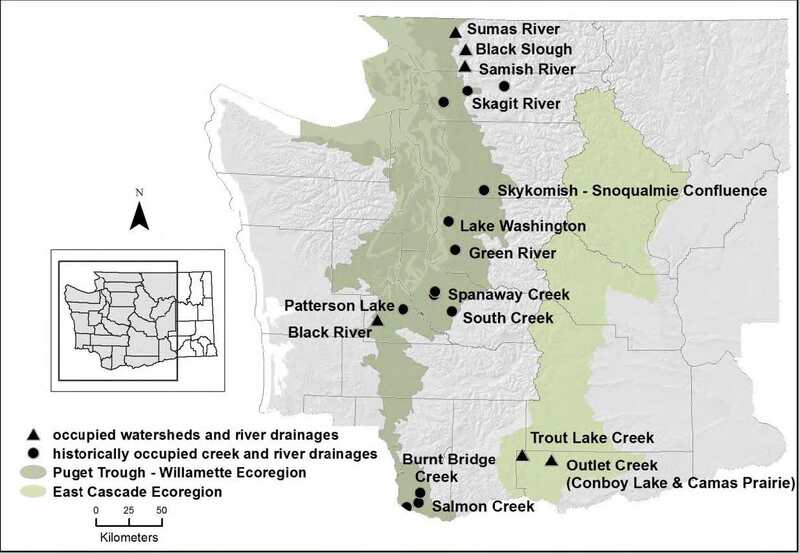 In 2012, five additional breeding areas were found on the Samish River, and a third breeding area was found along Black Slough. Also in 2012, a previously unknown population was found on a privately owned dairy farm near the town of Nooksack on an unnamed tributary of the Sumas River; surveys recorded a total of 45 Oregon spotted frog egg masses. Population estimates are based on annual censuses of egg masses. These assume one egg mass per adult female per year and one male breeding with each female. Surveys of all known breeding areas in 2012 found a total of 3,684 egg masses, which corresponds to a total population estimate of 7,368 breeding adults for Washington (Table 1). Conservation planning. The Washington Oregon Spotted Frog Working Group was formed in 2008 to coordinate and advise on recovery activities. It includes biologists from state and federal agencies, Port Blakely Tree Farms, Joint Base Lewis-McChord, The Nature Conservancy, Evergreen State College, Cedar Creek Correctional Facility, and members of the Northwest Zoo and Aquarium Alliance including staff from Point Defiance Zoo and Aquarium, Woodland Park Zoo, Northwest Trek, and Oregon Zoo. The working group contributed to the development of a draft state recovery plan for the Oregon spotted frog (Hallock 2013). Dailman Lake reintroduction project. A reintroduction project was started at Dailman Lake on Joint Base Lewis-McChord Military Reservation in Pierce County in 2008. The captive rearing project is a cooperative project involving WDFW, Cedar Creek Correctional Facility, Evergreen State College, Oregon Zoo, Northwest Trek, Woodland Park Zoo, Joint Base Lewis-McChord, and Point Defiance Zoo and Aquarium. Rearing facilities at Woodland Park Zoo, Northwest Trek, and Oregon Zoo receive eggs taken from wild populations in Thurston and Klickitat counties in early spring. In addition, Cedar Creek inmates raised frogs in 2009-2011 as part of a partnership between Evergreen State College and the Washington Department of Corrections’ Sustainable Prison Project, which allows prisoners to participate in science-based conservation projects. The tadpoles were captive raised until metamorphosis and then released in the fall of each year. As of November 2012, about 5,490 frogs were released. Biologists from Joint Base Lewis-McChord and WDFW monitor the released frogs and survey for egg masses in the spring. The only evidence of breeding by the reintroduced population was found in April 2011 when three verified Oregon spotted frog egg masses and eleven egg masses suspected to be Oregon spotted frogs were found by WDFW and JBLM biologists. Eleven embryos from both the confirmed and unconfirmed egg masses were collected for genetic verification and confirmed to be Oregon spotted frog. In 2012, no eggs resembling those of Oregon spotted frog were found by WDFW and JBLM biologists. The project will be evaluated in 2013 to determine if additional releases should continue. Protection, enhancement and management of habitat. Several properties are managed for Oregon spotted frogs, with most efforts focused on control of reed canarygrass in breeding areas. These include the Trout Lake Natural Area Preserve in Klickitat County, which was established in 1996 primarily for the protection of Oregon spotted frogs. Conboy Lake National Wildlife Refuge manages water and controls reed canarygrass to benefit Oregon spotted frogs. WDFW acquired the West Rocky Prairie Wildlife Area in 2006. Nisqually National Wildlife Refuge acquired occupied habitat on Dempsey Creek and the floodplains of the Black River. The Center for Natural Lands Management owns property on Mima Creek, which they are restoring for possible Oregon spotted frog colonization or translocation with funding from USFWS and the Natural Resources Conservation Service. Habitat enhancement is also taking place on private lands at the Salmon Creek site with support from WDFW and USFWS. Research to facilitate and enhance recovery. A number of research projects pertaining to Oregon spotted frogs have been conducted in the past few years. In 2009, WDFW and WDNR initiated experiments on control of reed canarygrass at Beaver Creek and Trout Lake. In 2009, Port Blakely Tree Farms began investigating cattle grazing impacts to oviposition sites using fencing exclosures to evaluate pre- and post-grazing changes. Also in 2009, a study was initiated to determine the species’ sensitivity to the chytrid fungal pathogen (Padgett-Flohr and Hayes 2011). In 2010, the Washington Department of Ecology funded the University of Washington to investigate the potential effects of exposure to the herbicide-surfactant combination Imazapyr-Agridex on juvenile Oregon spotted frogs. In related work, WDFW began a study in 2010 of amphibian phenology at Beaver Creek to determine which life stages would be exposed if herbicides were used to control reed canarygrass. WDFW is currently seeking funding to extend these tests. Oregon Zoo, WDFW, and Kyle Tidwell compared the anti-predator behavior of Oregon spotted frogs from Black River and Conboy Lake National Wildlife Refuge from 2009-2011. Partners and cooperators: Port Blakely Tree Farms, Washington Department of Natural Resources’ Natural Areas and Natural Heritage Programs, Washington Department of Transportation, U.S. Fish and Wildlife Service, Nisqually and Conboy National Wildlife Refuges, Department of Defense-Joint Base Lewis-McChord Military Reservation, U.S. Forest Service-Gifford-Pinchot National Forest, The Nature Conservancy, Northwest Trek , Woodland Park Zoo, Oregon Zoo, Cedar Creek Correctional Facility, Evergreen State College, Point Defiance Zoo and Aquarium, and, Capitol Land Trust, Mountain View Conservation and Breeding Center. Bohannon, J., D. Gay, C.O. Johnson, M. Widner and C. Bauman. 2012. Oregon spotted frog presence surveys in Skagit and Whatcom Counties, Washington. Final report on the 2011 and 2012 surveys submitted to USFWS, Region 1, Washington Fish and Wildlife Office. 20 pp. + appendices. Hallock, L. A. 2013. Draft Washington state recovery plan for the Oregon spotted frog. Washington Department of Fish and Wildlife, Olympia, Washington. Padgett-Flohr, G. E., and M. P. Hayes. 2011. Assessment of the vulnerability of the Oregon spotted frog (Rana pretiosa) to the amphibian chytrid fungus (Batrachochytrium dendrobatidis). Herpetological Conservation and Biology 6:99-106. USFWS. 2010. U.S. Fish and Wildlife Service species assessment and listing priority assignment form for the Oregon spotted frog (Rana pretiosa). U.S. Fish and Wildlife Service, Lacey, Washington. 82 pp. USFWS. 2011. U.S. Fish and Wildlife Service species assessment and listing priority assignment form for the Oregon spotted frog (Rana pretiosa). U.S. Fish and Wildlife Service, Lacey, Washington. 60 pp.